I had a profound experience the other day. I met my therapist, and as we often do, we started the session with a meditation by standing opposite to each other. I felt her excitement for all things spiritual and meditation related. I felt her smiling and eager to start the session. Then the feeling was gone and it was just me standing there, with tears in my eyes. I had felt the “oneness” that we all are. That I am you, you are me, and we are all one beautiful whole, but all separated into different souls for the purpose of incarnating on this beautiful planet. As a “seasoned” meditator I had had these feelings since many years while meditating, or while in divine communion with my higher self, but never so consciously without having meditated. I also had to admit, right there, that lately I had started to focus on our differences, more than our similarities. And I knew I had to stop. I knew I needed to focus on our similarities. I felt this was a powerful message for me to take into all of my relationships. 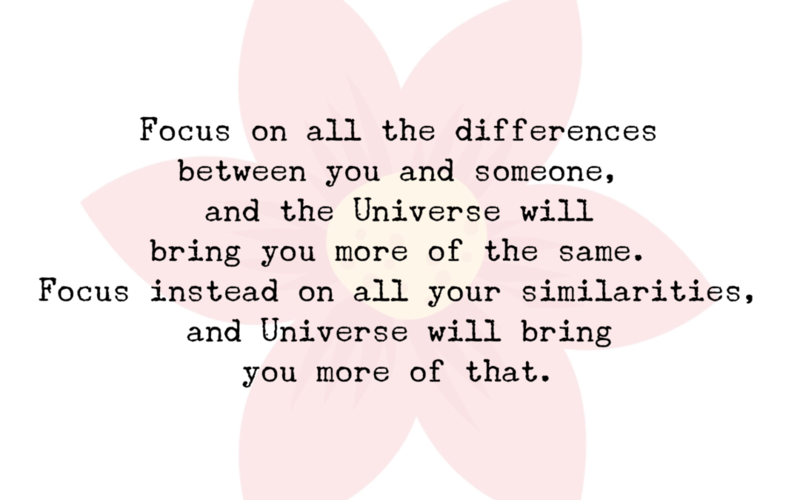 Nothing good comes out of focusing on our differences, dear ones. And even when we have difficult relationships with people (whoever they might be), we won’t solve any of it by focusing on our differences. However, there is a fine line between relationships that are difficult and relationships which are toxic. And there is no shame in walking away from a parent or other family member when they continuously harm us or don’t respect our boundaries. I have walked away from family and I haven’t regretted it. Do you need help to deal with difficult relationships and lots of tips and tools to keep yourself balanced in your day to day life? My program “Master Your Present” might just be perfect for you. Or book a FREE 20 minute chat with me to see how I can help you.